Remember the old adage, "a picture is worth a thousand words." Our Earth is in a period of warming but how warm will the planet get? Take a look at these models and data to make predictions about the future. The internet is filled with info graphs. We are bombarded by visual representations of data. How do we help students make sense of all of these visual data representations? The High-Adventure Science module developed by the Concord Consortium provides high quality interactive simulations, maps and data presented via graphs. Students answer questions about the images to guide them through the process of making sense of real world data. Students need to be able to construct their own knowledge. Using visuals and interactive simulations students can make sense of difficult concepts that would be difficult to understand any other way. They can work as scientists analyzing vivid graphics and controlling variables in simulations to explore cause and effect, changes in systems and models for understanding. The High-Adventure Science - Activity 1 Earth's Changing Climates presents to students a short written explanation along with a visual graph or chart for students to examine and analyze. Boxes are provided for students answers. As the facilitator of this activity, I can run a report at any time to view student responses for all students, one student, all questions or one question. Enroll students yourself. Using this method, you enter student names and create their user name / password. I enrolled one class, which made me familiar with the process. This could also be a significant time saver for classes that don't have 1-1 computing, or students who are unfamiliar with setting up accounts (although they do need to learn this at time point). For all the other classes, I had the students self-enroll. 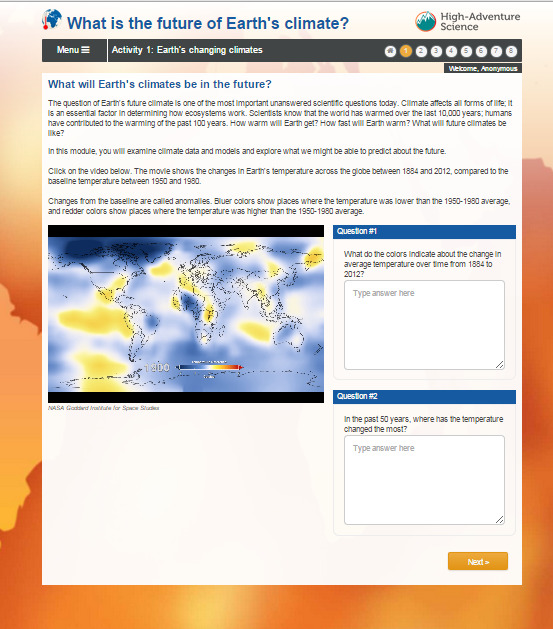 This lesson uses the High-Adventure Science activity - What is the future of Earth's climate? developed by the Concord Consortium. "What Is the Future of Earth's Climate?" High-Adventure Science. Concord Consortium, 2015. Web. 23 May 2015. I begin by engaging students in a whole class discussion. I want to prepare them mentally for today's lesson. In this lesson you will work as a scientist looking at the Anthropocene epoch, that is a proposed geological time when human activity has a significant global impact on the Earth's ecosystems. There are eight sections and fourteen questions. Each section has a visual representation of data and a short passage to read. Answer the questions using the information presented on each page. The website provides suggested answers to each question. I use these notes as I circulate around the room as students work. I like to work with my students one-to-one or in small groups. The High-Adventure Science format also allows me to run a report at any time. The reports can be generated for all students or one student, all questions or a single question. In this section's resources, you will find a sample report generated at the end of each section. My students select the print option and select PDF as their printer. The PDF responses are then shared with me via Google Drive (no paper!). I find students are actively engaged in their exploration of the site. In this short video, I share some of the reasons my students found this simulation more engaging than others. The final question question in this model was the most powerful for my students. Explain how scientists can be both fairly certain that Earth is warming and still actively researching the unknown factors? Student answers are on the mark and they know that scientists do not know all the reasons for Earth's warming and they need to continue their research to find additional factors and interactions so they can predict the future. What can we infer about the nature of science? Do scientists have all the answers? This starts a great discussion. Scientists and we as humans still have a lot to learn about our planet. A student references a TED video we watched where the speaker suggested that we know less than 1% about the inner workings of a cell. Another students reminds us of an article that suggests that two-thirds of the organisms in the ocean are still being discovered. As scientists we do not know all the answers. Science is ongoing discovery and applying new knowledge to what we already know. We need to ask questions, make inferences and ask more questions.